Both types are installed without visible fixings that penetrate the cladding and have provision for expansion due to the design of their clipping system. The advantage of secret fixed roof and wall cladding is that longer lengths can be used than with pierced fixed cladding and there are no exposed fixings. Where the required lengths are too long to be easily transported, and the contract warrants it, the roll forming can be done on-site to avoid damage and reduce packaging and transport costs. The loads imposed on the cladding are described in section 3.4. In many cases, the uplift load that can be resisted by these component parts or the re-entrant cladding design is not as great as that for pierced fixed cladding. 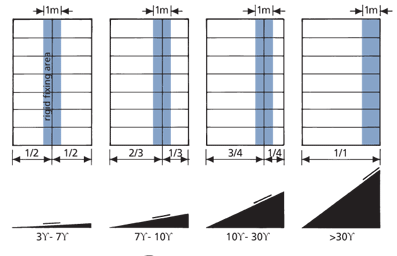 Designers should be aware of these limitations in high and very high wind design load areas. The weakest parts of the clipping system are usually the clips or the clip fixing to the substrate, as the clips are secured by using screws, nails or rivets. Each clip must enable free movement for expansion within the clipping system. Each clip must have a minimum of two fixings, and the pull-out or withdrawal load of each fixing must exceed half that of the wind design load. The fixings must be suitable for the substrate. 10# x 25mm wafer head screws. 12# hex head screws (where profile provides clearance). Secret fix clips must not bind the cladding, as this will erode the metal and produce excessive noise. Clips must be fixed at centres determined by the panel width and the wind design load. Additional clips must be used to provide resistance to the high wind load in the peripheral areas of the roof. Self-supporting secret fixed claddings can be curved over a radius, but as they are asymmetrical profiles, the radii should be shallow to avoid purlin creasing and panning. Unless expansion provisions are made to positively fix elsewhere, secret-fix sheeting should be fixed at the highest point to avoid creep on steep roof slopes or due to the action of snow. Fully supported roof and wall cladding is a secret clip fix type of flat roof or wall panel, which is joined by seaming, welting or clipping and does not have any external through fixings. Fully supported cladding is described as non-structural because it requires continuous underneath support, as distinct from self-supporting metal cladding which is structural. Individual sheets are described as bays or panels. They are not intended to support walking loads without a structural deck of timber or rigid insulation beneath them, although some spanning support is offered by the standing seams or batten rolls. Wall details use similar detailing to roof details except that panels are positively fixed at the top. The metals used for fully supported roof and wall cladding have historically been non-ferrous and have a reputation for providing a trouble and maintenance free roof, often for centuries. The methods used to fix this type of cladding are labour intensive and therefore expensive. However, fully supported cladding is a better option in terms of life cycle cost. This type of cladding is termed architectural because as vertical cladding or curved roof cladding, it is a dominant feature of the architectural style of the building. Unlike modular profiled metal cladding, the width of the bays can be custom made and they can be tapered or curved. Because the role of the architect or designer is expected to be more dominant, giving greater attention to detail than with other types of cladding, it is strongly recommended that early liaison occurs with designated or nominated roofing contractors. Because of the skill required to install this type of roof cladding, the designer is advised to seek out a contractor that specialises in this field and whose tradesmen are capable of installing fully-supported cladding that will last for over 100 years. It is impossible to detail every junction or option for fully supported cladding in this COP, but it does provide typical details. Traditional architectural annealed metal panels limited to 1.8 m in length. Long length strip roof cladding up to 10 m in length. Both traditional architectural and long length strip-roof-cladding types share the same seaming methods and also many of the same flashing and fixing details. The cover requirements may differ from profiled metal cladding because whereas profiled laps are overlapped, fully supported cladding laps are seamed. When annealed grades of metal are used in short lengths, the folds can have a generous radius, because the details are hand worked and do not possess the straight lines associated with machine folded or roll formed cladding. The use of both types of fully supported metal roof cladding without structural ribs gives rise to undulations in the wide flat pan, which are not only to be expected but an architectural feature of fully supported cladding. A perfectly flat metal surface cannot be obtained when using wide flat panels, and designers should be aware that fully supported roof or wall cladding will reflect light unevenly, particularly when it is new, and it will not change by increasing the thickness of the cladding. If designer or customer expectations include flat panels without distortion, then narrow pan secret fix profiled and ribbed metal roof cladding should be considered. If wide flat panels for walls or facades without ribs are required, the COP advises using bonded panels. Most metals used for this type of cladding are non-ferrous and naturally weathering, and acquire a patina over time that enhances the appearance and the durability of cladding. Zinc and copper can be supplied in a pre-weathered or pre-patinated finish, and this can avoid the discolouration caused during installation and the uneven colouration of individual panels in sheltered areas. The loadings, installation, performance, maintenance, corrosion, drainage, and site practice sections of this COP are all applicable to fully supported cladding and should be read in conjunction with this section, which contains only specific detailing and reference to fully supported cladding. Traditional roofing or architectural non-ferrous metal panels have been used in short lengths for many centuries. They are associated with longevity and a distinctive architectural style. Traditional fully supported roof cladding is made from a sheet, whereas long length cladding is made from pre-formed continuous strip. Until the 1950's continuous strip was not available. Fixing did not include expansion details. Annealed metals used in short lengths are now limited to specialised uses — such as turrets, domes or curved structures — requiring a considerable amount of hand working. The availability of metals in continuous coils has permitted the industry to take advantage of the old technology and apply it to long lengths of fully supported roof and wall cladding. Long length roof and wall cladding are roll-formed in longer lengths, generally using the same joining, fixing methods, and installation techniques as traditional roofing or architectural metal panels. Long strip copper roofing systems have been used in the United Kingdom and Europe for over fifty years, and aluminium have been used in NZ for a similar length of time. The main advantage of the longer lengths of the system is the elimination of cross welts on sloping roofs and of drips on flat roofs, thus effecting reductions in the labour cost of laying short lengths of metal roof cladding. The length of individual panels is governed by the type of edge seam, the metal, and the provision for metal expansion of the panel. By using expansion clips incorporated in the standing seams, longitudinal movement of the panels is permitted while still providing a secure fixing to the under-structure. Roll formed tray roofing panels can be varied in their width to suit the architectural design and the wind design load on the building. They can also be supplied with various upstand heights and details including locking edges similar to secret fixed profiles. Long strip copper roofing can be laid in continuous lengths of up to 10 m long by 500 mm wide compared to the maximum 1.8 m by 600 mm bays used with traditional annealed panels. Where the rafter length is greater than 10 m, either a step or a cross-welt is required, depending on the roof pitch and the wind design load. The roll cap is a variation of the standing seam because it has two standing seams one on either side of a square or trapezoidal timber batten. The double seam and angle seam has only one seam. Conical roll and other types of jointing have been used in the past, but the most common systems are outlined below. The thermal movement across the width of metal panels is taken up by the provision of a gap at the base. The term 'standing seam' refers to the way the panels are joined in a vertical, or "standing", position. After being laid on the substrate and clipped, it is seamed either by hand or seaming machine. The angled seam is the same as a standing seam but has only been folded over by 90°, not 180°. It is considered only suitable for walls and pitched roofs, but not for low slope roof cladding in exposed areas. The angled seam has the advantage of a more dominant and a straighter line, which is obtained by a roll forming machine rather than hand working, and it is used when the aesthetic expectations are high. 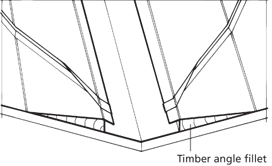 The angled seam is restricted in snow areas to a roof pitch of more than 25°. Roll cap systems are made from materials of a temper suitable for springing or snapping together. There are many variations, but all depend on the interlocking of a cap and the panel. Some panels have interlocking edges and do not need a separate capping. When using traditional short lengths, adjacent sheets of metal are joined lengthwise using cross welts and drips for the transverse joints. These types of joints allow for expansion. Ridges and eaves panel fixing details must accommodate the lengthwise expansion movement of the sheeting. Batten rolls running from ridge to eaves can be used on all roofs were the minimum pitch is 5°. The transverse seams on standing seam roofs with a pitch of less than 20° in areas of high or very high wind design loads, must be soldered or sealed. A double lock cross welt transverse joint must be used for joints on roofs with pitches of more than 7°, and single lock cross welts must be used on pitches above 25° or on vertical surfaces. The double lock cross welt must be used in all cases where severe weather conditions exist. 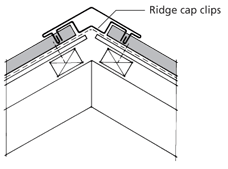 The maximum length for roof pitches of less than 30° must be 10 m. Where a roof slope exceeds 10 m, a 50 mm deep step flashing must be placed at regular intervals to provide for panel expansion in the direction of the fall. The double lock cross welt should be used in all cases where severe weather conditions exist. Where the pitch is below 20°, the edges of the metal forming the double lock cross welt should be soldered or sealed with silicone sealant before closing the welts and seams and folding together. Cross welts used with standing seams should be staggered in adjoining bays to compensate for the increase in thickness of many-layered metal, but batten roll joints from ridge to eaves may be used in a continuous line across a roof. Although a long strip roof can be laid entirely using conventional hand tools, power or hand operated machines are used on long panels to save time. All joints in weathering details for penetrations, rainwater heads, stop ends, and expansion flashings in sheet copper should be sealed by brazing with silver solder. In zinc, all joints should be sealed using lead/tin soldering. All metals should be mechanically locked before sealing. All transverse and longitudinal joints on fully supported metal roof and wall cladding must only be welted, lock seamed or capped, and must not be joined solely by soft soldering, welding or brazing. Where the direction of fall is diagonal to the standing seam and welts, the laying direction of the bays must be away from the flow. Where rainwater will drain to one side of the bays, high-velocity streams of water flowing down the seams and welts should be directed away from the seamed side of the panel. Light gauge wide pan widths should be avoided because they give rise to sheet drumming and consequential fatigue. Metals used in traditional architectural panels and used as fully supported cladding include lead, annealed copper, zinc and aluminium. Metals used in long length architectural panels, however, generally use a harder temper or alloy and include copper, zinc alloyed with titanium/copper, aluminium, stainless steel, and plain and pre-painted AZ coated steel. The metals described in 15.4.3 Standing Seam Materials are suitable for long length fully supported cladding. Copper, aluminium and stainless steel can be supplied with an embossed surface finish, which not only reduces glare but can also provide additional strength. Roof cladding, gutters, and expansion and fixed clips should be made from a minimum of 0.6 mm half-hard temper strip, conforming to the British Standard, BS 2870. Roll formed panels using secret fix interlocking edges that are made from half-hard temper, should not be silver soldered or brazed, because the heat required will anneal the copper. When softened areas in half-hard copper can develop differential stress patterns, caused by expansion, which can result in fatigue and eventual failure of the metal. Where penetration or other flashings require an amount of workability or are to be silver soldered or brazed, they should be made using fully annealed copper sheet or 0. 6 mm thick strip. See 4.17.5 Copper. Zinc roof panels and flashings should have a minimum thickness of 0.7 mm, although heavier gauges are used. Copper and titanium are alloyed with 99.995% pure zinc to provide additional strength. See 4.17.4 Zinc. Pure aluminium strip (99%), known as 'dead soft', is used for flashings in widths between 150 mm and 600 mm in thicknesses of 0.30 mm, 0.45 mm, 0.55 mm, and 0.70 mm. Stainless steel has a higher strength than most other metals and can be used in a lighter gauge or thickness. It is compatible with copper but should be used with caution with other metals. See 4.10.3 Compatibility Table. Metallic and organic coated steels can also be used for fully supported roof and wall cladding. They require the same treatment as self-supporting roof and wall cladding and the same design criteria as for other metals. See 4.17.1.1 Metallic Coatings and 4.18 Organic Coating. The uplift forces on fully supported roof cladding are transferred through the building through the clips and fasteners to the substrate. The performance criterion is the number of clips or fasteners per square metre, which can be varied by the spacing of the clips or the width of the bays. The withdrawal load of the fasteners depends on the metal, shank diameter, shank type, penetration depth, and the type and thickness of the substrate. The design load capacity of a clip can depend on the material of the clip and the thickness of the substrate. The clips and fasteners should be able to withstand the wind design load, measured in kilonewton (kN), which is derived from the square measure of kilopascal (kP). Maximum clip centres for different wind loads shall be derived 15.4.4A Load/Clip Spacing, after making provision for local pressure factors. placing the clips closer together. The clip spacing is determined by the wind design load, the thickness, type of substrate and the holding strength of the nails or screws. To comply with the wind design load criteria, the withdrawal load of the clip/nail assembly should be known for the thickness and type of substrate. Gable or verge panels must be wider than 400 mm, and the clips must be fixed closer together on the edges of all roofs in high wind design load areas. Unlike profiled metal cladding, the point load imposed on fully supported cladding is supported by the substrate. Hand or gun-driven screws both provide better performance and are the preferred fixing. The depth of penetration is a major performance factor when considering the wind design load. Ideally, clips should be positioned to coincide with sarking support positions. When plywood substrate is used beneath fully supported roof cladding, it should be smooth and dimensionally stable, with a moisture content of less than 18% and made windtight. All screws should be countersunk to prevent damage to the metal cladding. Plywood with a minimum thickness of 12 mm should be fixed to the framing at 600 mm centres, with 40 mm x 8# countersunk screws at 150 mm centres around the panel edges and 200 mm centres on the intermediate supports. The fasteners should not be closer than 10 mm to the edges. Although 17.5 mm plywood will span 1200 mm, the length of the fasteners should be increased proportionately. A 3 mm expansion gap should be provided between sheets and a nail or screw can be placed in the gap and be used as a spacer for this purpose. All joints should be staggered and taped over before placing the underlay. Framing centres should be designed to withstand the increased loads at the periphery of the building. Ventilation must be provided for all fully supported roof designs using plywood substrate. See 10.6 Ventilation. CCA treated plywood must not be used under zinc, aluminium, metallic coated or prepainted steel cladding without an underlay complying with 11.5.1A Underlay Suitability or without being separated by an underlayment as described in 10.7.5 Non-Residential Buildings. Provision must be made for adequate ventilation under the sarking. Where the design wind load is higher than 1.5kPa, the minimum fixing centres for 12 mm ply substrate must be 400 mm. Nails: stainless steel or hot dipped galvanised enhanced shank nails 25 mm long. Screws: stainless steel or hot dipped galvanised countersunk 25 mm long x 8#. Nails: copper or stainless steel 25 mm long x 2.6 mm barbed shank flatheads. Screws: Stainless steel countersunk 25 mm long x 8#. 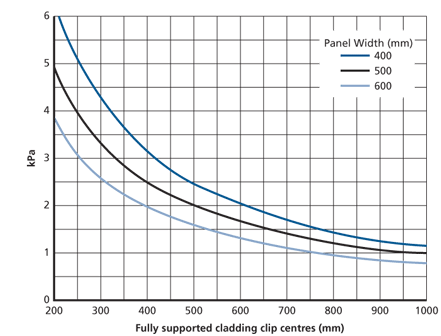 Standing seams up to 3 m long may be secured entirely with fixed clips, but for longer lengths than 3 m, expansion clips should be located above or below the fixed clips to allow for longitudinal movement of the panels. Fixed clips should be positioned at centres dependent on the design wind load. See 15.4.4A Load/Clip Spacing. The position of the fixed clips depends on the roof pitch. On a pitch of more than 30°, the clips should be placed at the top of the slope. All fully supported metal roofs must have an absorbent and permeable underlay to absorb condensation. Underlay must be laid as detailed in 10.7 Underlay and must be covered on the same day. separates metal cladding from timber treated with copper preservative. All fully supported metal roofs must have provision for ventilation of the timber substrate to allow dissipation of condensation. Copper is not corroded by retained moisture, but most other metals can suffer degradation from continued exposure to moisture. Zinc is particularly prone to corrosion, but zinc coil is available with a high-build lacquer or specially treated underside to avoid the effects of retained moisture. Where the design is likely to cause continued moisture or cannot provide sufficient ventilation, enhanced underside treatments should be considered for zinc. The best provision is always to provide sufficient ventilation at the eaves and ridge, and the minimum of a half an air change per hour to ensure that any condensation is not retained. Proprietary vents made from aluminium or polyethylene can also be used at one per 50m2. These should be placed over a purpose made hole or at the intersections of the 3mm gap between the plywood sheets. See 10.6 Ventilation. Fully supported valley gutters should comply with 5.6 Valley Gutters. Where a valley is formed between two roof slopes, a separate valley gutter welted to the roof sheeting should be used. By dressing over an 15.4.7.1A Angled Timber Fillet with a single welt on the top front edge of the fillet. This detail is not suitable for high or very high design wind loads. By forming a 15.4.7.1B Re-entrant Fold in the valley to accept the panel turn under. Valleys should be secured using clips with a minimum of two fasteners, installed parallel to the valley, and be formed from at least the same gauge metal as is the valley metal flashing. Securing clips with two fasteners side by side holds the clips in place more securely than using one fastener per clip; with only one fastener, cyclical thermal movement of the valley metal will loosen the fastener, and the valley can bind against the misaligned clips. The back tab of a clip should be bent over the fastener heads, and the tab flattened, to keep the fasteners from backing out and from damaging the underside of the metal roof panel. Because valleys attached with clips can move within the clips due to thermal expansion and contraction and slip downslope with time, the head of the valley should be securely attached to the substrate. A raised centre within the valley flashing allows for some expansion and prevents water flow running across the valley from one side to the other. See 15.4.7.1B Re-entrant Fold. Where a valley drains from a dormer roof and the capacity of the panel or bay does not equal the discharge, it must be spread over two or more bays. See 9.9 Dormer Junctions. Fully-supported facade or wall cladding is used for architectural effect. The width of the panel and the metal thickness can be different from those used for roof cladding. As flat panels do not have a perfectly flat surface, and to improve its visual effect, the maximum panel width should be restricted to 500 mm, and a maximum of 400 mm for panel lengths over 5 m.
The substrate should be true and in line. Any defect will show and care in seaming is necessary, particularly at the clip positions. To avoid large flat areas, panels can be divided into smaller lengths by single welts, by varying the length or using a diagonal pattern. New panels require precise and clean preparation of the individual components by skilled tradesmen before completing the patination. Special care is needed for the storage of the panels, flashings, and components to avoid dirt and staining. Because the standing seam or the batten roll should terminate at the peripheral areas on the roof, this detailing will be determined by the type of intersection. All flashing intersections must be made weatherproof without primary reliance on sealants. 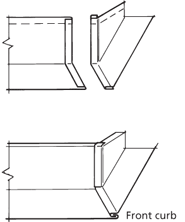 Provision must be made for expansion in two directions; acceptable joints are shown in the drawings shown in 11.8. Three stages in preparing standing seam for cross welt at drip, ridge, apron or junction to valley gutter. A double standing seam can be turned down through 90°, 150 mm from the eaves, with the folded side uppermost, and the end of the turned down standing seam folded into a cleat, drip or valley. When the sheet is engaged into the folded edge at the stepped fall, an allowance should be made to allow for thermal expansion. The turned down edge of the bay should not be able to disengage itself from the eaves flashing during thermal expansion, and there should be sufficient room to allow for free contraction of the pan or bay. The double seam does not need to be folded over in roofs with pitches greater than 30° as the eaves flashing will prevent any ingress of moisture. The double seam is cut at the eaves, and only the end of the sheet is engaged in the eaves flashing. The double standing seam with a splayed or angled lower end is the most demanding end detail, but it is the most visually acceptable. The method that is used to finish the ridge and a double standing seam depends on whether the type of ridge detail is vented, has a separate ridging, is welted, and whether it is a standing seam or a roll. Where the panel passes over the ridge or hip of a roof, a roll not less than 38 mm higher than the intersecting rolls or standing seams should be provided. The ridge roll should be undercut to accommodate thermal movement of the panels. Where the panel terminates at a wall, there are many different details some of which are similar to those required at the ridge. Aprons and flashings to walls and upstands should consist of an independent, preformed strip of metal of not more than 1.8 m in length, welted to the roof sheet or cover flashed to give a minimum 100 mm cover to the vertical upstand. Where a standing seam meets an abutment, the standing seam can be finished as for profiled metal roof cladding with an apron or the end of the seam can be flattened to facilitate folding the metal to form the upstand. At the highest point of the roll, where it meets an abutment, the sheet is dog-eared to form a corner, and the upstands are welted to the capping and cover flashing. See 15.4.9.2A Standing Seam Abutment. Where an apron abuts a block or brick wall, the cover flashing should be folded a minimum of 25 mm into the wall chase with a 10 mm hook wedged into the chase and pointed with a flexible sealant or cement. All free edges should be stiffened as described in Flashings and when retained within a cleat the edge should be free to provide expansion. See 8.3.2 Flashing Edges. Joints at eaves and verge edges should provide a secure, wind tight termination for the roof, but be capable of accommodating the thermal movement of the panels without overstressing the metal. Expansion provision must be made at eaves and verge edges and at the joints. Penetration flashings for fully supported metal roof cladding must be installed by the roofing contractor only, and other trades must not cut any hole in fully supported metal roof or wall cladding. The back curb of the flashing upslope from the penetration should be installed under the roof panels, and the front apron of the flashing should be installed over the roof panels. The designer is responsible for coordinating the penetration location to be sure that a penetration will not coincide with the panel seams. When the penetration is less than 50% of the width of a panel, the hole can be weathered by using a fabricated flashing made by forming an upstand by soldering, welding or sealing. Small pipe penetrations that can be installed within the width of the individual roof panel can be weathered using an EPDM proprietary flashing as described in 9.6 Boot Flashings These are not the preferred option as the expected life of these flashings is unlikely to equal that of non-ferrous fully supported roof cladding. Shop fabricated flashings may require a conical metal rain collar or a 'Chinese hat' to provide sufficient movement if the pipe is sleeved or insulated. Large penetrations are more complex and require additional considerations during design and installation. Regardless of the penetration size, weatherproofing should be achieved without relying solely on sealant and independent movement of panel and penetration should be allowed for. 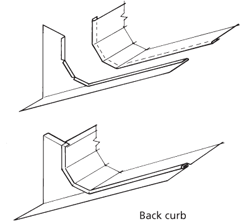 When the penetration width is over 600 mm the panel ribs should be stopped short of the upslope face of the curb, so that water can flow past the ends of the ribs and not be trapped against the curb. 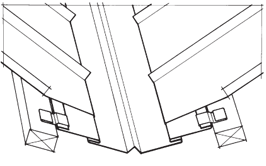 Large penetrations that require flashing through the panel ribs and are over 600 mm wide should be factory manufactured to a cricket design as described in section 15.8. Flues should be terminated at a sufficient height above a metal roof and discharged in such a manner as to ensure that concentrated flue gases do not come in contact with the cladding. The majority of flashings are made from fully annealed or dead soft metal, but where rigidity or a straight line is required, only half-hard grades of material should be used. Cappings can be welted to the upstands of panels instead of using through fixings. Corrosion can be caused by using dissimilar metals in contact with, or run-off from, other roof cladding materials. Designers and tradespeople should be aware of the electrolytic corrosion that can take place when small particles of metal are deposited on another metal, and when the same tools are used with a variety of metals. See 4.10 Compatibility. For maximum durability, no water should be allowed to penetrate between stacked panels, strips, profiled sheets or coils during storage and transportation. In high humidity with the simultaneous exclusion of air, white rust will develop on the surface of zinc and zinc coated cladding, and aluminium and copper will also suffer permanent staining. All metals in storage should be kept dry. See 13.4 Acceptance Of Materials. Metals and metal alloys used for the fabrication of architectural roof panels and accessories are often those that are naturally weathering and whose surfaces develop a layer of protection upon exposure to the elements. Aluminium, copper, lead, stainless steel, and zinc are all naturally weathering. A naturally weathering metal forms its own protective layer by oxidation, sufficient to withstand environmental exposures and to develop oxidation layers that are durable and well-bonded to the base metal, with minimum porosity and minimum solubility in water. This weathering and subsequent oxidation can result in a different colour and appearance as well as protecting the metal. Upon exposure to the atmosphere, copper develops a protective film called patina, and its composition depends on varying regional atmospheric conditions. In industrial and urban atmospheres it consists mainly of basic copper sulphate, and in non-urban environments it consists of basic copper carbonate. These copper salts have chemical compositions similar to those found in natural minerals, and once the patina has developed, no further copper corrosion occurs under normal conditions, As it is self-healing, any superficial mechanical damage is repaired by the renewed formation of patina. The patina, consisting of green copper salts, is often described as verdigris which is inaccurate, as verdigris is caused by the chemical reaction of copper with acetic acid. In contrast to copper salts, which form a natural patina, verdigris is water soluble and is visually recognised by its strikingly green colour. Atmospheric corrosion of copper occurs at 2-3 µm per year depending on the environment, but this rate is applicable only during the first few years and with time it decreases until it reaches zero after 70 years. Copper components exposed to the atmosphere undergo various stages of discolouration from the time of installation to the development of the natural patina. Minor marking will become invisible as copper develops its primary protective film, a uniform brown oxide, after a few weeks due to the reaction with atmospheric oxygen. The intensity of the brown colouration increases with time until the patina develops as a secondary layer of various shades of green. In mild environments, it may take over 30 years to turn green and in some dry environments, it may never turn colour. Strength properties and the degree of purity of the copper do not affect the rate of patina formation. In some locations or positions, the slope of the roof, or vertical surfaces or soffits, can affect the development of the patina to the degree that copper may never turn green. Copper can be pre-patinated or patinated after installation, and these field methods may provide rapid patination, but the resulting colour can vary significantly. Patination can be affected by any streaking, marking, or soiled areas or by perspiration caused by handling, which can be avoided by the use of cotton gloves during installation. Water run-off from copper can visibly stain light-coloured building materials, such as concrete, brick and stone. The chemical process which results in the formation of the protective film on the surface of zinc has several stages and may take a long time to develop, depending on the season, weather and other factors. During this transitional phase, the surface appears to be irregular due to light reflection. As patination progresses these reflections will disappear; the greyish blue protective film will become denser and the colour more uniform. Patination can be artificially accelerated and Titanium Zinc can be supplied pre-weathered to prevent any difference in appearance of adjacent panels. Unwashed areas of zinc and aluminium cladding can show an uneven and patchy surface film when they are in an aggressive environment. Maintenance is required as for other metals. See 16 Maintenance .